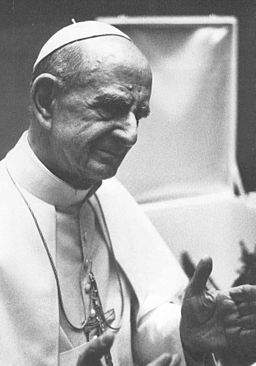 Today the Vatican announced that Pope Francis has approved the promulgation of the decree to beatify Pope Paul VI, formerly Giovanni Cardinal Montini. See details at Vatican Radio and details of his beatification miracle, the healing of a child born in California in 2001, at Vatican Insider. And see my article of today about the bond between Pope Paul VI and St. Therese of Lisieux. Pope Paul VI will be beatified on Mission Sunday, October 19, 2014, at the end of the Third Extraordinary Synod of Bishops on the Family (a synod he established). It's also the 17th anniversary of the day St. Therese of Lisieux was declared a Doctor of the Church and the sixth anniversary of the day her parents, Louis and Zelie Martin, were beatified. Both of those ceremonies also fell on Mission Sunday. This date is most fitting because Pope Paul VI opened the way for St. Therese to be named a Doctor of the Church and for her parents to be beatified as a couple. The cause for Louis Martin was opened in the diocese of Bayeux on March 22, 1957, and the cause for Zelie Guerin Martin was opened in the diocese of Sees on October 10, 1957, both during the papacy of Pius XII. Their last surviving daughter, Celine (Sister Genevieve of the Holy Face) had the joy of testifying about them before she died in 1959. But Pope Paul VI made two important contributions to the cause. It was he who, with the the Sacred Congregation for the Causes of Saints, approved the writings of the Servants of God, Louis and Zelie Martin. And in 1971, for the first time in the history of the Church, Paul VI, finding that they became holy as spouses, ordered that the two causes be united into one single cause. He laid the foundation for their being beatified together in 2008 and for the possibility of their being named saints as a couple. (An Italian couple, Blessed Luigi Beltrame Quattrocchi and Blessed Maria Corsini, were beatified in 2001. Their cause, however, was introduced only in 1994, long after Paul VI united the causes of Louis and Zelie Martin). How marvelous that he will be named blessed on the anniversary of the beatification of this blessed couple.